A style of glass that relies on color, texture, and form for its visual appeal. Decorative glass which includes stained, beveled, fused, blown, etched, leaded and cut. Several types of glass with newly developed surface textures, shaded colors, or casing, made in the United States from about 1870 and in Europe between about 1880 and 1900 or more generally, any ornamental glassware made since the mid-19th century. Glass characterized by experimentation with various materials to produce artistic effects. It was most commercially popular in the United States from the 1880s to 1920s. Art glass normally means the modern art glass movement in which individual artists working alone or with a few assistants to create works from molten glass in relatively small furnaces of a few hundred pounds of glass. Black enamel was made from ground glass plus iron filings. 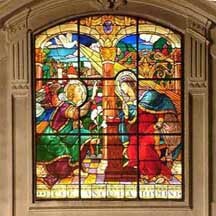 It was used to create the details on the earliest stained glass. It could be applied thick and black, or as a thin gray or gray-brown wash.
A thick, circular piece of glass set, as in a roof or ship's deck, to admit light. A slender, grooved lead bar used to hold together the panes in stained glass or lattice windows. Extruded pure lead that is milled to specific dimensions as either "U" or "H" shaped strips, then cut and formed to accept and hold the stained glass shape. It's available in spools or precut lengths of about 6 feet. Later, zinc, copper, brass, etc. were substituted for the lead. Leaded glass: Glass panels made by combining multiple small pieces of glass, which may be stained, textured or beveled, with cames. Usually, solder is applied on both sides of the came where pieces meet. A design or study drawn of the full size, to serve as a model for transferring or copying - used in the making of stained glass windows, mosaics, tapestries, fresco paintings, etc. The line drawing for a work of glass with all cut lines shown. Individual pieces may be numbered and color shadings indicated. A second copy is cut for pattern pieces. Domestic, transparent (below), colored glass, machine made with double rollers to uniform 1/8" thickness and either smooth or variously textured. Although machine made, the name comes from its resemblance to stained glass first used in Medieval European cathedrals. A surface texture resulting from the chilling of hot glass on a cool table. The texture is in the table, not on the roller. Catspaw Glass appears as though a cat has walked across its surface and left paw prints. Transparent and available in many colors, it is often used for backgrounds or special effects. A cementing compound is brushed under the edge of all the lead to fill in any space between the lead and the glass. The front side of the window is cemented first and allowed to cure; then the backside is cemented. Created by dipping a molten cylinder of glass into water which causes the exterior of the glass to crack but the molten interior holds together. The cylinder is sliced down the side, flattened and the crackle textures are rolled into glass. Refers to a sheet of heavily folded glass that suggests fabric folds. A small diameter handheld roller is manipulated forcefully over a sheet of molten glass to produce heavy ripples, while folding and creasing the entire sheet. The ripples become rigid and permanent as the glass cools. Tiffany made abundant use of drapery glass in ecclesiastical stained glass windows to add a 3-dimensional effect to flowing robes and angel wings, and to imitate the natural coarseness of magnolia petals. Enamels are soft powdered colored glass that is mixed with a medium and painted onto the glass with a brush. When the medium is dry, the glass is placed in a kiln for firing. The Romans mixed the powdered glass with oil until it has the consistency of paint. In the Gothic era, black enamel was made from ground glass plus iron filings. The Romans also cold-painted, i.e., did not refire the glass after it was enameled. Another coloring method, discovered in the sixteenth century uses enamels. 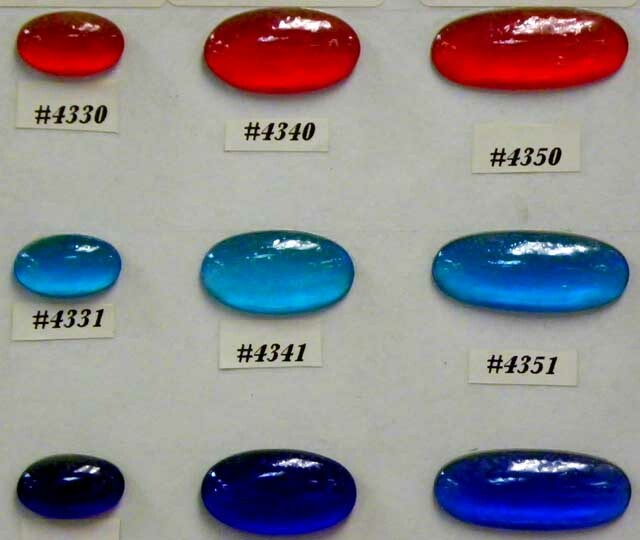 Enamels arc compounds of ground glass and oxides that become fairly transparent when heated and fused to clear or white glass. Entire scenes can be painted in colored enamels on a single piece of glass. As the use of enamels became more widespread (during the seventeenth and eighteenth centuries) all the old methods of coloring glass - pot metal, flashing, and staining - were nearly lost. Colored enamels seldom have the brilliance of pot-metal glass but can take on a rich translucence when enamels are carefully applied. Enameling fell out of favor in the late-nineteenth century as interest in the ancient stained glass techniques rekindled. 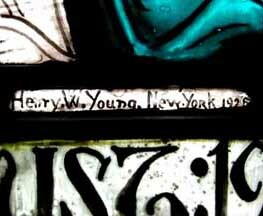 - Nola Huse Tutag, Discovering Stained Glass in Detroit. Wayne State U. Press, 1987, pp. 9-10. Method of removing one layer of color from flashed glass in a hydrofluoric acid bath. The glass to be etched is exposed via cutting a stencil from a completely covered piece of glass. Hydrofluoric acid is the only liquid material that will dissolve silica - the main ingredient in glass. The length of exposure to this corrosive acid will determine how far the acid will eat into the glass. Large faceted glass pieces arranged mosaic-style in concrete or epoxy. Faceted glass is constructed of 1" thick chunk stained glass, cut to shape and then cast in an epoxy resin. The result is a very heavy and durable window panel. "Slab glass" is chipped on the edges to cause thin flakes of glass to break off the flat surfaces. Pieces of this type of glass are set into an epoxy-concrete mixture to produce large architectural window-walls. The fractured edges ("facets") cause the light to bend and refract (break into a rainbow of colors). 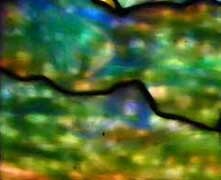 Favrile glass is a type of iridescent art glass designed by Louis Comfort Tiffany. It was patented in 1894 and first produced in 1896. It differs from most iridescent glasses because the color is ingrained in the glass itself, as well as having distinctive coloring. 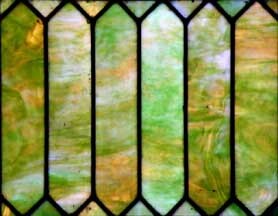 Favrile glass was used in Tiffany's stained-glass windows. At the 1900 Paris Exposition, Favrile glass won the grand prize in the exposition and is appointed a Chevalier in the Legion of Honor. Flashed glass is one sheet of glass made of two layers of color. Any color can be flashed on top of another. Made by dipping a ball of semi-molten (below) white ("colorless") glass into molten colored glass which, when blown (below) and flattened, results in a less intense color because it will be white on one side and colored on the other. 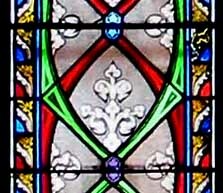 In the Gothic era, natural pot-metal (above) glass colored blue or red was too dark to transmit much light, so the medieval glazier (above) hit on the technique of flashing. A semi-molten cylinder of colorless ("white") glass was dipped into a pot of red glass so that the red glass formed a thin coating. This allowed a variety in the depth of red, ranging from very dark and almost opaque (below), through ruby red to pale, and sometimes streaky red that was often used for thin border pieces. The red of double-layered glass could be engraved or scraped to show colorless glass underneath. The original color thus revealed could be either left in its original state or painted. This affected the size of individual pieces of glass, which now became much larger and less geometrical. Only one section was now needed for a face, its hair, and the surrounding halo, instead of the previous three. In the late medieval glass this method was often employed to add rich patterns to the robes of saints. You can easily tell a piece of flashed glass by scratching at a corner with a glass cutter or just chipping a small bit away. The underlying color will show through. A great deal more light can pass through a window containing grisaille and/or flashed glass, which means that dark interiors can be illuminated much more efficiently. The technique of controlled melting of combinations of glass in layers using a kiln. Glass is commonly made by combining materials such as silica (sand) - the main ingredient - , potash, and lead oxide at a high temperature in order to allow the materials to melt and fuse together. When cooled rapidly, the substance becomes rigid. Glass is made with very basic ingredients. Silica (sand) is the main ingredient, and then added to that are ashes from trees or plants which help the sand to melt. Something like lime is also added which is a stabilizing ingredient, and it protects the glass from moisture. Virtually the same recipe as that given on a cuneiform tablet of the seventh century B.C. is in use today. No one really knows how glass came to be made. it is older than the Ten Commandments and probably originated somewhere idcn the Middle East. it was adopted by the Romans, who contributed significantly to its development; it flowered under the Islamic empire; and it reached new heights in Renaissance Venice, whence it spread throughout Europe and eventually to America. 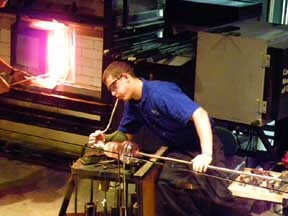 The art of shaping a mass of glass that has been softened by heat by blowing air into it through a tube. 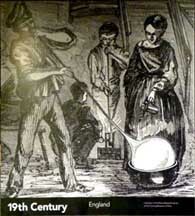 A glass forming technique that involves inflating the molten glass into a bubble, or parison, with the aid of the blowpipe, or blow tube. A person who blows glass is called a glassblower, glassmith, or gaffer. His reheating furnace is called a "glory hole" (below). The discovery of glassblowing was made somewhere around the year 50 BC by the Romans. 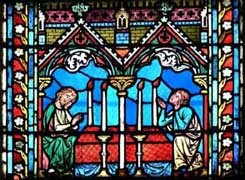 Most early stained glass was made by mouth-blowing long cylinders of molten glass, which were partly cooled, had the ends removed, were cut open, reheated and flattened. Window or panel or ornamental designs, composed almost exclusively of uncolored glass in which the designs are created by the black leads alone or with the addition of paint and silver stain (below). 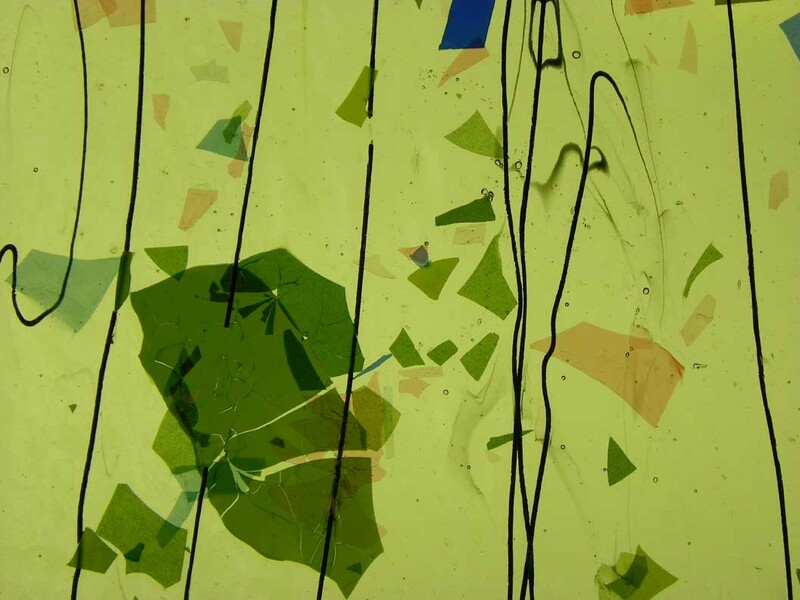 Monochrome painting on glass using a mixture of ground glass, ground lead and other substances. The word is derived from the French "grisailler," meaning to paint gray. Decorative work or illustrative scenes rendered mainly in shades of gray (or muted brown). Grisaille is the use of black enamel to create patterns on clear glass that was then refired. Grisaille is a lacy (foliate) pattern painted on light glass with vitrifiable paint (able to be fired and turned into glass) and fired. Grisaille usually include either foliate (oak, maple, rose, etc.) or geometric (usually strapwork) patterns. Strips of color were sometimes added to the monochrome of grisaille. 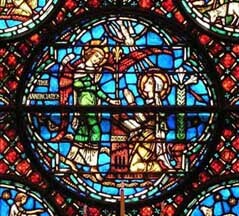 Toward the end of the thirteenth century a desire for more illumination surfaced with an increase in nonfigurative windows and concentric patterning that incorporated more transparent glass. 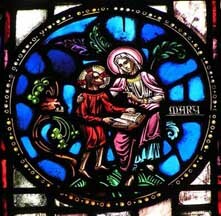 Grisaille glazing was first favored by the Cistercian Order under St. Bernard, who found that figurative windows distracted monks from religious responsibilities. Grisaille is non-figural, but full color figural imges were often interspersed, especially as roundels. 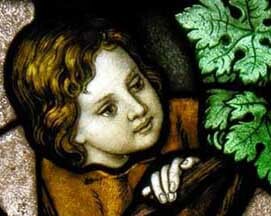 Grisaille glass often forms the groundwork for a Gothic window in which subjects, figures, or heraldry are introduced. Grisaille became increasingly common throughout England and France until it all but replaced stained glass in what little was left of the market in the seventeenth and eighteenth centuries. Grisaille pattern in the nineteenth century was most commonly achieved through the use of tin stencils (illustration). Studio catalogues often included suggested figural or symbolic inserts. In the nineteenth century revival, combinations of grisaille and figural glass were as important as they were in the Middle Ages. For many congregations opposed to imagery, such as Baptists, non-figural grisaille remained the glazing choice throughout the nineteenth century. Grisaille windows were often installed as temporary measures, to be used only until a church could afford stained glass or until stained glass windows and memorials were donated. Grisaille is used on quarry (below) glazing. 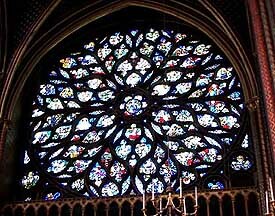 Grisaille glass has been used in churches over the centuries to glaze windows until more costly stained glass could be afforded. Grisaille, a thirteenth-century development named for its gray appearance, is comprised of a delicate pattern painted on clear glass with a thin gray or black line, and then fired. The technology has changed little today. Toward the end of the thirteenth-century artists began inserting small colored panels or medallions into the grisaille glass bordered with pot-metal stained glass of either abstract or plain design. Stained glass also fills the traceries. 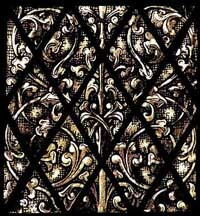 The leading in the windows is diamond shaped, and the delicately etched grisaille patterns vary in theme with each window. Piece of hot glass that is press-molded into a jewel like shape. Cathedral or opalescent glass that has been pressed into steel molds and then polished for consistent shapes and sizes. Faceted round, navettes and square shapes; smooth ovals and rounds, raised swirls and "iceberg" shapes are just a few of the types of jewels available. A chamber made of firebrick in which to bend or fuse glass. Size ranges from small tabletop units to 3' x 4' bed, floor models. They can be electric or gas heated. The Opalescent Glass Works at Kokomo, Indiana is the oldest manufactory (since 1888) of its kind in America. 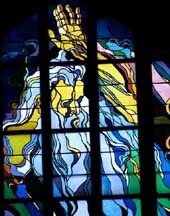 In 1889, Kokomao won a gold medal at the Paris World Exposition for their multi-colored window glass. In Gothic churches, medallions in nave windows depicted scenes from the Old and New Testaments. Glass in a melted state after the ingredients have been fused at a high temperature, liquefying the batch. It is then allowed to cool until it is plastic and shapeable. It is sticky and will adhere to an iron blow pipe (above) or other glass object already heat-softened. Glass with areas of opaque and translucent spots of color. May be one, two or three colors per sheet. Well suited to organic and three-dimensional imagery. Patterned with spots or blotches. Glass that has variation in coloration in the form of small spots, some of which run together. Traditional mottled glasses impart an orangish gray cast to the glass. A small, compact chunk or clump. A small, irregularly shaped "glob" of glass, flat on the bottom, rounded across the top. Nuggets are made by literally dropping a small amount of molten glass onto a flat surface. 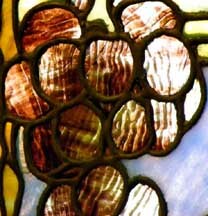 Frequently called "globs," they are often incorporated into leaded glass artwork. Often used to replace smaller round pieces in a design, such as grapes in a cluster, a flower center, or to add dimensional interest to a piece. 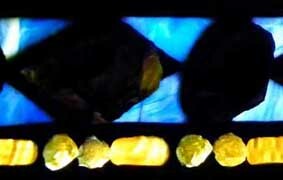 Sizes range from 1/4" to up to 2" in diameter and come in a variety of cathedral (above) and opal (below) colors. Both John LaFarge and Louis Comfort Tiffany used irregular nuggets, chipped and fractured wih a hammer - usually calledjewels (above). Obsidian is the result of volcanic lava coming in contact with water. It is cooled extremely quickly, causing it to create a beautiful glassy texture. 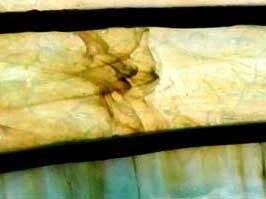 Most obsidian is 70 percent silica (sand) - just like modern factory-made stained glass used for windows. Obsidian can come in many different colors including dark green, dark brown, black, golden sheens, beautiful yellows, blues, and tinges of purple. Iron and magnesium typically give the obsidian a dark green to brown to black color. Obsidian can also come with small white inclusions made from cristobalite. These small white crystals look very similar to snowflakes and are called Snowflake Obsidian. Its splinters are often transparent (below) or translucent (below). 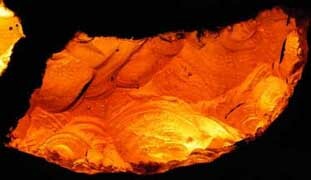 It is a naturally occurring volcanic glass that was the first form of natural glass used by humans. In the Stone Age, it was fractured to produce sharp blades or arrowheads. 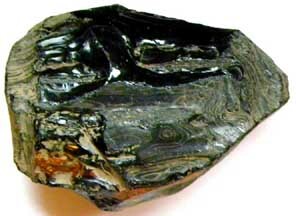 Today, obsidian glass is used to make scalpel blades used in cardiac surgery. The obsidian used as the illustration was purchased from Past and Present. Neither reflecting nor emitting light; allowing little or no light to pass through. VS. translucent (below): letting only some light through, so that objects on the other side appear blurry. Pot furnace where the sand and other ingredients are placed in pots (below) to be melted to produce glass. 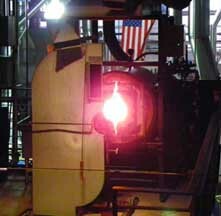 Nickname: "jaws of hell"
Reheating oven used by the gaffer (above) while s/he is fashoning glass objects. Nickname: "glory hole"
Traditional ovens have been made of brick, often in beehive shape. 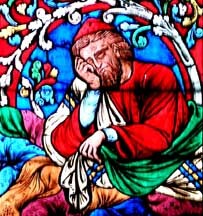 From the fourteenth century in Italy, translucent (below) oil paint ["enamels"] was painted onto stained glass to enrich the range and quality of colors. Depicting historical scenes that were scattered over a window ignoring the window support lines. Sometimes glass is more than one layer thick, meaning another piece of glass may be mounted in front of, or behind another, which requires additional glass and modified construction techniques. [John] La Farge's intense admiration for the monuments of the past and his commitment to innovation of the present encouraged his experimentation with opalescent glass. The material evoked an older, tactile adornment of early Christian stone inlay and mosaic. La Farge later described his combining selected stained glass in a variety of tones and a new material, an opalescent type of commercial glass previously used mainly as a porcelain substitute in toiletries such as brushes and mirrors. He applied for a patent for these techniques in November 1879. The application makes it clear that he did not claim to have invented the milky glass of variegated color we now call opalescent. Rather, he claimed a patent for its use in plated stained-glass windows where areas of the window are comprised of several layers of glass stacked one on top of the other and leaded together. Plating adds depth to the play of color and light in the composition. 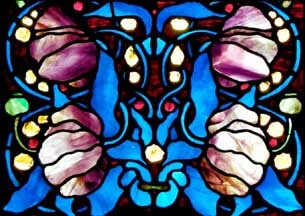 With such work, La Farge was seen as a designer of promise, and in 1880 Herter Brothers, a decorating firm in New York, hired him to provide windows for the homes of American millionaires,including Cyrus W. Field, Darius Ogden Mills, andJ. Pierpont Morgan in New York. A solid metal rod used, tipped with a wad or ring of hot glass, to remove a blown object from the blowpipe in order to allow the top to be finished and any other final shaping to be done. When the glass has cooled and solidified it is knocked off the rod, leaving a rough mark, the 'pontil mark'. Refers to the place on the base of a glass object where it is attached to the punty rod or pontil while the blower is shaping and finishing the piece, and then snapped off and polished smooth. Pot metal is glass that is of one solid color, no texture and extremely opaque with no light transmitted. Two examples are solid, dense white and black. In medieval times, to lighten the color, flashing was used. The medieval name for the molten glass batch. It was heated in a large crucible and metallic oxides were added for color. Colored glass, known as "metal" was made by adding various metallic oxides to the crucibles ("pots") in which the glass was melted. This is the basic stained glass of a single color. Sheet glass can be made by the centuries old method of mouth blowing. The glass is blown into cylinders. The closed end of the cylinder is cut off and the side cut to flatten into a sheet. Sand, soda and lime are fused together in a pot, or crucible, at a very high temperature, at which time chemicals, metals or metallic oxides are added to the molten mixture to produce a full range of colors. The product is known as "pot metal" or "pot metal glass." The glass blower gathers up the required amount of molten metal on his long rotating pipe and blows a bubble or blows the shape in a mold. The ends are cut off the bubble and the sides of the resulting cylinder are split. Oven treatment produces flat sheets approximately 15"x17". Contemporary glass produced in this manner is called "antique glass." Variation in color and thickness even within a single sheet of glass contribute to the infinite possibilities available to the creative team. The illustrative series of small images or carvings which often decorate the base front of an altarpiece or stained glass window. Predella imagery tends to depict a narrative series such as tales from the bible. A small square- or diamond-shaped pane that is colored, painted, printed or impressed with a design and used to create a regular decorative pattern in a window. In Gothic style windows, quarries are small panes of glass, usually lozenge-shaped and sometimes decorated with motifs painted in yellow (silver stain) or in brown (grisaille). Quarry is a shape that may be clear, colored, painted or stenciled; grisaille is leaded or painted or silver stained pattern on quarry shapes. One may refer to grisaille quarries, but not all quarries are grisailles. Quarry windows sometimes include pictorial mandorlas or roundels (below) set against a background of quarries. Sheet of textured glass with marked surface waves. Louis Comfort Tiffany made use of such textured glass to represent, for example, water or leaf veins. A mouth-blown piece of glass that has been spun into a circular shape, often irregular. Sometimes incorporated into leaded glass artworks. The heavier center is called the "navel." 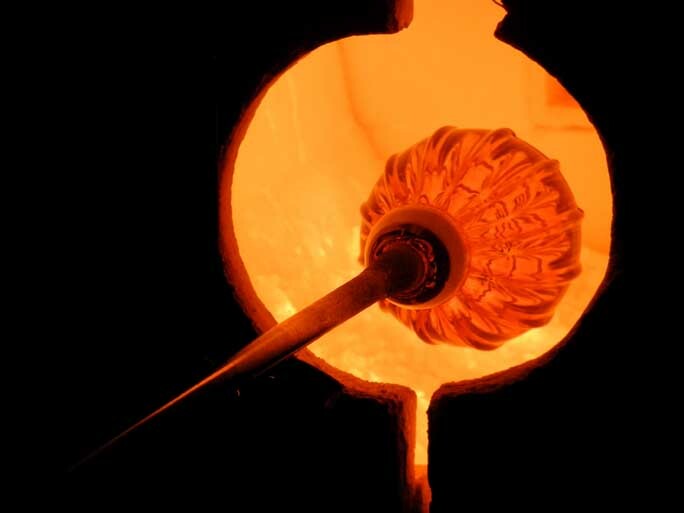 To create a rondel, molten glass is taken from a furnace with a blowpipe (above). The molton glass is blown out into a small bubble. The small, still hot, ball of glass will now be attached to a pontil rod (above) and broken from the blowpipe, causing the characteristic "navel." By spinning the glass, a small rondel is formed. For more information, see "How Rondels Are Made." Machine-made facsimiles are common, called "pressed rondels." Not to be confused with roundel below. Not to be confused with rondel (above). Small circular panel or window. Single piece of colourless or non-pot-metal glass, either round, square, rectangular, or oval, that is painted with a self-contained design. Roundels are single sheets of glass, usually circular, that are painted with a self-contained design, and which are often associated with medieval glass from the Low countries. 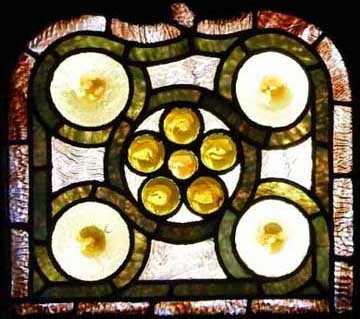 In the 17th century, roundels were set in windows composed of quarries (above). In heraldry, a roundel is any circular shape. Roundels were commonly used in medieval homes and many of the designs provide glimpses of contemporary life and humour - including hybrid creatures and scenes from the agricultural year. In the victorian era, birds were a favorite subject matter for roundels. 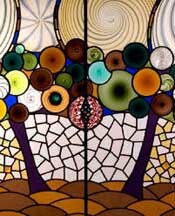 The round support bars on a stained glass window. They are attached to a stained glass panel with copper wire that has been soldered on to lead joints (where one piece of lead meets another) and then the ends are twisted firmly behind the bar to hold the panel in place. The flat support bars are called fins. They should be soldered directly to the stained glass panel at all possible lead joints. Both saddle bars and fins should be attached to the sash as well as the panel, otherwise, it's just a piece of metal attached to the window, not supporting it. Booklet available for purchase: Stained Glass Association of America, "Standards and Guidelines for the Preservation of Historic Stained Glass"
A printing method of applying paint to glass where the paint is forced through a fine mesh (screen) overlying a stencil. Paint is deposited in the open areas of the stencil. Silkscreen is an example of stencil technique. Illustration: Asbury Delaware Methodist Church / Babeville.... .
Silver salt allowed glaziers to make a piece of white glass shade into yellow without resorting to cutting and also to alter the tone of a piece of coloured glass, which could now be given two colours without the addition of a lead bar. The stain, which was generally applied to the outer surface of the glass, penetrated during firing, after which the artist painted the inner surface in the usual way. The recipe for silver stain, which had been known since the sixth century to the Egyptians, who used it to decorate vases, is thought to have reached Europe from the East at the end of the thirteenth century. 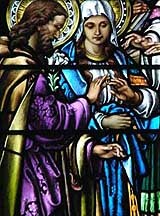 Its application to stained glass was completely to transform the future of the technique, freeing it from the restraints of the lead lattice and allowing it to become painting on glass (enameling above). This where the term "stained glass" comes from. Silver stain where the term "stained glass" comes from. 3.Cut glass. Some pieces are then left as they are, others have additional artwork. 5. Lead the window. To hold all the glass pieces together, a frame work of lead is used. 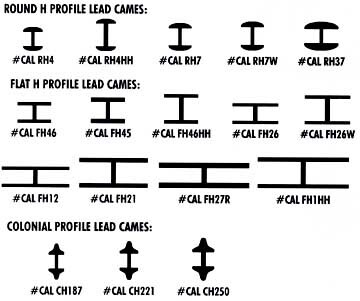 The lead is shaped into the from of an "H" to surround each piece of glass. select colors that are to be put in. Cut the glass and fit the pieces together with the grozing iron. and solder on both sides. Surround it with a wooden frame strengthened with nails and set it up in the place where you wish." The subject of our windows were probably selected by Dr. Moore and approved by a church committee and the most generous potential donors. The Payne-Spiers studio of Paterson, New Jersey was commissioned to produce a small, scale design incorporating these subjects. Once approved, a full scale design, would probably have been executed in watercolor to simulate somewhat the translucence of light. This design would be translated into full-size working drawing, the "cartoon," showing the exact dimensions of the completed window. A tracing ["pattern"] from the cartoon is cut up to make templates for each piece of glass, minus the shapes are cut and filled, reassembled by the glazier on a large piece of clear glass to ascertain whether the color, tonal value and type of glass follow the original design. With light from behind, the artist now uses black or brown vitreous paint with a variety of brushes for shading, matting, stippling and line work. Silver nitrate "stain" may be used to affect the colors. To permanently fuse the paint and stain with the glass the pieces are fired in a kiln. 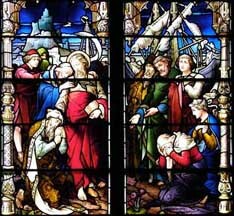 Given the fact that stained glass windows are pictures FROM pieces of glass, the method and material of joining the pieces is an equal component in the creative process. 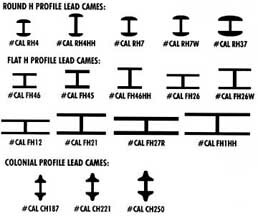 The shaped pieces are inserted into H-shaped lead strips called "cames" and joints are soldered. The final union is "cemented" together to prevent leakage in the rain. The Process: The preparatory sketch [usually a watercolor] is translated into full-size mechanical drawings (cartoons) and further into actual patterns to be used to cut the glass. Once the patterns have been prepared and assigned color, the glass is cut into the myriad pieces required to build the window. When the design requires detail painting or ornamentation of the glass surface, it must be done with pigments designed specifically for stained glass. The pieces of glass are joined together with lead came (H-shaped strips) and soldered at their inter-sections on both interior and exterior surfaces of the assembled panel of stained glass. Varying widths of lead came are often used to add to the window's decorative effect as well as enhance its strength. In glassworking, staining is the process of coloring the surface of glass by the application of silver sulfide or silver chloride, which is then fired at a relatively low temperature. The silver imparts a yellow, brownish yellow, or ruby-colored stain, which can be painted, engraved, or etched. Subsequent stainings and firings can produce a deep orange. Because of silver staining, yellow and green grew in popularity at the expense of the old favorites, blue and ruby. It was discovered around the beginning of the fourteenth century, apparently in France, and was used sparingly at first, and then very creatively to produce local contrasts on colored glass. Sheets of colors streaked across the surface. They are similar in this to opalescent (above) glass, but being transparent (below) they have a delicacy and imprcssiveness that can be breathtaking when the light streams through. Many of the English Strcakies, in addition to combining wide ranges and flow of colors, also add a rippling (above) of the glass itself - a textural component that makes the colors simply dance across the sheet. Streakies are particularly effective when used in windows as sunsets, cloud-filled skies, ocean waves, landscapcs, mountains, or rainbows. Streamer glass refers to a sheet of glass with a pattern of glass strings affixed to its surface. 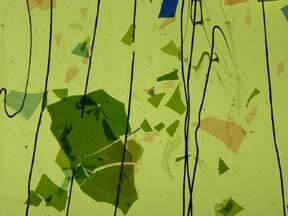 Tiffany made use of such textured glass to represent, for example, twigs, branches and grass. Streamers are prepared from very hot molten glass, gathered at the end of a punty (pontil) that is rapidly swung back and forth and stretched into long, thin strings that rapidly cool and harden. These hand-stretched streamers are pressed on the molten surface of sheet glass during the rolling process, and become permanently fused. Illustration: Bullseye glass on sale at Sunshine Glassworks, Ltd.
Studios design, fabricate, repair, and restore stained glass. To be distinguished from stained glass suppliers (e.g., Kokomo above), although studios may work with suppliers to develop an original color, texture, etc. Studios (or designers in the studio) sometime sign their work. Glass that allows only some light through, so that objects on the other side appear blurry. If you place your hand behind translucent glass, you can see its shadow but can't see any of the distinct features. Used in panels and windows. Almost always the primary glass used in lamps. VS. opaque (above): Neither reflecting nor emitting light; allowing little or no light to pass through. VS. translucent (above): Glass that allows only some light through, so that objects on the other side appear blurry. Molded glass tiles that are usually irregular in shape and thickness. The top is uneven. Multi-colored. Tiffany used turtlebacks in windows and lamp shades. Tiffany's turtleback tiles were pressed from iron molds and iridized while still hot. The Studios produced them in several sizes, shapes and colors, but the most common style and the one which they usually employed in the leaded shades is a large ovoid shape, approximately 6" x 4 3/4". Because the edges of these pieces were up to a half inch thick, they had to be heavily chipped to fit into the came, a difficult procedure that required a lot of skill and patience. Preparatory sketch in the stained glass making process. The client must approve the design, coloring, etc. before the next step is taken.